Gogo Emma Mambane waits in anticipation outside the house that is earmarked for renovation as an elder care facility for “orphaned” gogos, supported by Grannies à Gogo: the Vernon South Africa Connection. I see Emma Mambane struggle to negotiate some steep steps, her cane in hand. She is one of a new breed of gogos (“grandmothers”) who is now just beginning to be recognized. The plight of child orphans in Africa is one that has bubbled to the surface in the wake of massive HIV/AIDS deaths in the 20 to 45 year-old generation. However, there’s another type of “orphan” that has been hidden and neglected, and it’s that of the elderly generation. The concept of an elder care residence is one we have been born into in our Canadian way of life. Our facilities come in many variations – retirement homes, assisted living housing, complex and acute care nursing homes. However, in Africa, the idea of putting an elder into an old-age home is unheard of. Until now. The practice for centuries was that frail seniors lived with, and were cared for by, their adult children. But now the middle generation has become drastically reduced. 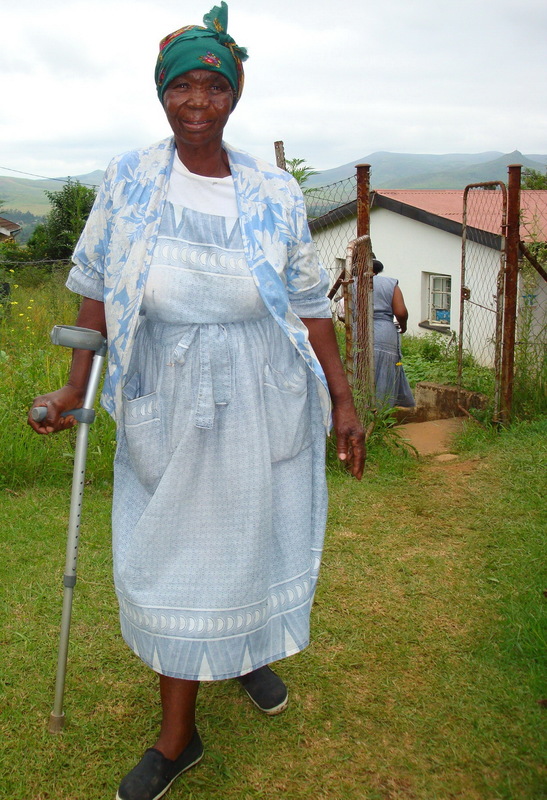 A number of gogos who are supported both financially and through personal contact by Grannies à Gogo: the Vernon – South Africa Connection, are no longer able to physically care for themselves. This senior generation is the one who suffered the oppression of apartheid during their formative years, then fought to gain democracy during their adult prime and now, instead of relaxing in their senior years, are parenting their orphaned grandchildren. This plight has been recognized by Rev. Ginny Cormack, our volunteer administrator with Sitabogogo in Sabie, South Africa. She has received permission to renovate a vacant Mission House on the township’s Anglican Church property to serve as an elder care facility. I was pleasantly surprised to find a solid house with a living/eating area, four good sized bedrooms that will accommodate eight beds, a small but adequate kitchen and tiny bathroom. The electrics need to be redone, the kitchen re-outfitted, and the bathroom completely redone. My professional draftswoman friend from my four years of living in Sabie has succumbed to my not-so-gentle arm twisting. She is now on board, researching ideas for the renovation before drawing up plans, and will work closely with the builder doing the renovation. We’re thrilled that Kelowna’s Gift’s to Grandmothers is now a sister group to Vernon’s Grannies à Gogo, and has pledged to financially help with renovations, as well as with the building of Ubuntu Centre, detailed in Part 1 of this report. Despite the hardships these gogos have endured, I’m continually moved by the merriment they express when together. They sing frequently and uninhibitedly, their voices rich in exquisite three or four part harmonies learned since they were babes on their own mothers’ backs. And when they have good reason to celebrate – look out! You are likely to be privy to an impromptu concert worthy of celebrity status, should some promoter discover these ladies and take them on a North American tour. Purely by chance, I happened to be in Sabie at a time when the gogos had great cause for celebration: the wedding of our tireless volunteer and hugely loved administrator, Rev. Ginny. Last year she was devastated when her beloved husband died suddenly in hospital. Her sorrow was compounded with the destructive civil unrest I described in Part 1, when they had to abandon the centre which had become pivotal in their lives. At the wedding reception five of the gogos had been cooking since the morning, and a bus was organized for all the gogos to join the other guests at dinner. They presented a celebratory song and dance in honour of the new couple. Later the mix of Western and African music had all the guests cutting loose on the dance floor. Ginny and her new husband had stipulated no wedding gifts. Instead, it was suggested that those who wished could buy vouchers at the local grocery store for the Fill-a-Bag program. These are bags filled with non-perishables for about $15 for distribution to vulnerable families. While Grannies à Gogo contributes to the Fill-a-Bag and many other the gogos’ programs, we’ve received from their ‘Fill-a-Heart’ program. With every visit I’ve come to know them better on an individual basis, and feel such a compelling connection. Many of the Vernon area women have developed similar bonds through their letter writing partnerships. What we all truly understand is that it’s team effort — the whole thing has become bigger than the sum of its parts. So much to watch for and support in the year ahead.